Bollywood superstar Shah Rukh Khan along with filmmaker Imtiaz Ali met Gujarat Chief Minister Vijay Rupani, while promoting his upcoming film "Jab Harry Met Sejal".On Thursday, Shah Rukh shared a photograph of himself along with Rupani and thanked him. 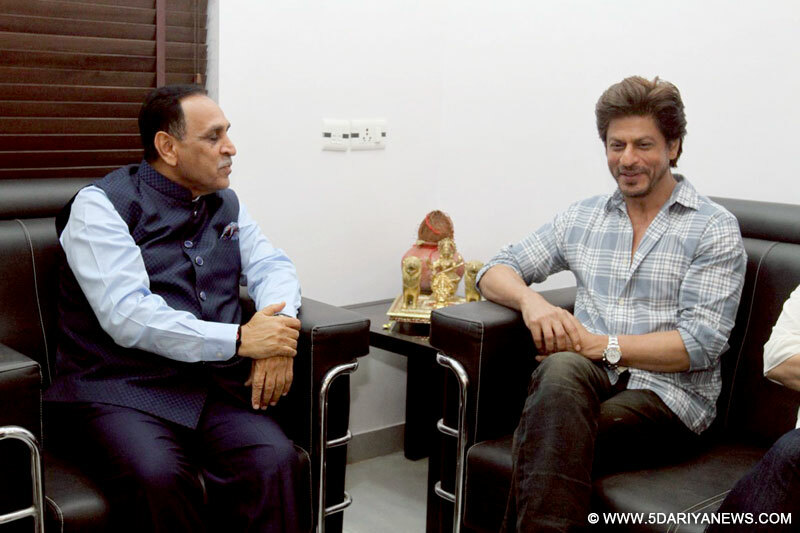 "Thank you honourable Chief Minister of Gujarat Vijay Rupani for regaling us with your stories of the past struggles and vision of your future dreams," Shah Rukh tweeted.Shah Rukh and Ali unveiled the film's first song titled "Meri Radha" in Ahmedabad and also met all the girls named Sejal and Radha in the city. The film, which is directed by Imtiaz Ali, also stars Anushka Sharma, who made her debut alongside Shah Rukh in 2008 with the film "Rab Ne Bana Di Jodi". "Jab Harry Met Sejal" is slated to release on August 4.